I am delighted to be here at ‘India Aviation 2016’, which is the confluence of industry leaders of the civil aviation sector from India and across the globe. This 5th International Exhibition and Conference on Civil Aviation is a laudable initiative of the Government of India in collaboration with Federation of Indian Chamber of Commerce and Industries and other stakeholders to showcase the latest innovations in aerospace technology from across the globe. 02. I am pleased to note that this aviation event shall provide a vibrant business platform to more than 200 participants from India and 25 foreign countries. This includes leading manufacturers of aircrafts and helicopters; airport infrastructure developers, operators, airlines, bilateral and multilateral agencies and suppliers of technology in the civil aviation sector. This platform shall enable them to discuss, debate and explore the possibilities for long-term strategic partnerships for manufacturing, maintenance, repair and operations in the aerospace industry of India. 03. India is one of the fastest growing economies of the world and is expected to be amongst the top three manufacturing destinations by 2020. The stable and consistent policies of the government; favorable demographic dividends; growing infrastructure; sustained availability of low cost skilled work force and strong technical and engineering capabilities has made India a favorable destination for foreign direct investment. 04. It is heartening to note that Indian civil aviation market is growing at a rapid pace and now ranks ninth in the world. It is estimated that by 2020, India would be the third largest civil aviation market. With a network of domestic and 85 international airlines connecting 40 countries, Indian airports handled passenger traffic of 190 million persons in 2015. Yet India is one of the least penetrated air-markets in the world with 0.04 trips per capita per annum as compared to 0.3 of China and more than 2 in the USA. 05. Despite rapid growth of civil aviation industry in India, several Tier II and Tier III cities of India still remain unconnected or inadequately connected with the national grid. With the existing economic centers reaching a saturation point, business activities are bound to move to newer destinations. North- Eastern States still lack adequate air connectivity due to paucity of civil aviation infrastructure. 06. The air travel has ceased to be a luxury these days. The middle-income population of India has grown by 60% over the last 5 years and has reached about 270 millions in 2016. The consistent increase in income levels of the middle class in India has enhanced their capacity to undertake air travel for business and leisure. This has resulted in further growth in the business of low cost airlines. 07. The development of tourism, trade and travel has also contributed to the increased passenger traffic in India. By 2020, the total passenger traffic in India is likely to touch 421 million. It is time for the government and all stakeholders of the Civil Aviation Industry to leverage this tremendous business opportunity. 08. It is estimated that India shall require at least 800 aircrafts by 2020 to cater to the phenomenal increase of air passenger and freight traffic. The supporting aviation infrastructure has to be suitably upgraded by building new Greenfield airports; expanding the existing airports and upgrading facilities for maintenance, repair and operations. 09. 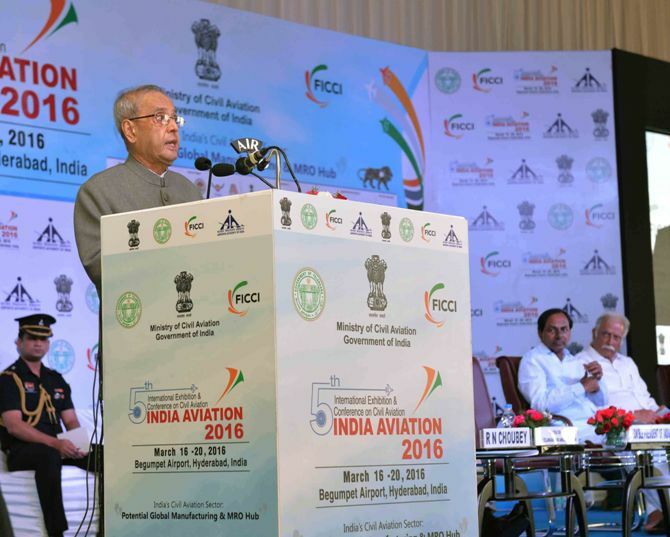 With the emerging demand of Indian aviation sector, the Aviation Event 2016 provides unmatched opportunities for all stakeholders and aviation players across the globe. It also offers a ready platform to discuss the emerging opportunities; policy challenges, regulatory framework and international best practices to develop long term sustainable business relationships to catalyze further growth. 10. This event brings together the developers and operators of airport infrastructure, airlines, bilateral and multilateral agencies, aircraft and helicopter manufacturing companies, aerospace technology providers. The stakeholders can draw out an action plan to make India as a hub for manufacturing, maintenance and operation for aerospace Industry. 11. India has taken a major leap in boosting manufacturing with "Make In India” initiative. It is aimed to facilitate investment; foster innovation; protect intellectual property and build world class manufacturing infrastructure. 12. For a long-term sustainable growth and global competitiveness, India has to create an enabling environment for innovation and inflow of state-of-the-art technology. The National Manufacturing Policy of India is a significant policy initiative of the government to address the multiple challenges faced by the entrepreneurs. 13. The civil aviation sector of India is poised for a faster and sustainable growth with the development of 100 smart cities; new economic corridors; more than 50 new airports and expansion of existing airports. The government is planning to invest over 120 Billion US$ in the development of airport infrastructure and Aviation Navigation Services over the next decade. The deeper air penetration to smaller cities; better connectivity to North Eastern part of India; higher disposable incomes of the middle class of India is expected to further propel the growth of Indian Civil Aviation Industry. 14. I am pleased to note that India has registered a growth of 14% in Civil Aviation sector during the last decade. The Foreign Direct Investment in air transport during last 15 years has touched the mark of 570 million US $. India continues to be a favourite destination for foreign investors in civil aviation sector. 15. The government has allowed FDI through the automatic route to the tune of 100 % in green field airport projects; helicopter services and seaplanes; maintenance and repair organizations and flying training institutes. 49% FDI is allowed through the automatic route for domestic scheduled passenger airlines and ground handling services. 16. The Open Sky Policy; greater focus on infrastructure development; liberal FDI norms; robust technical and engineering capabilities; assured supply of skilled work force in Information Technology and Communication network has opened the doors to global players. This will make India as a manufacturing hub of aerospace industry. 17. I am confident that this conference shall provide an opportunity to all stakeholders to observe and understand the latest innovations in the aviation sector. It will also promote latest international best practices; explore the possibilities of long term sustainable public private partnerships and forge new alliances. I also hope that this platform shall provide a blue print for indigenization of state-of-the-art aerospace technology in India and enable it emerge as a prominent hub for aerospace manufacturing, maintenance and operations in the years to come. 18. As India is at the threshold of taking a major leap in the aviation sector, this event is well timed and resonates well our latest policy initiatives of ‘Make in India’, ‘Stand up India’ and ‘Start Up India’. It is for the global giants to seize this opportunity and take lead to forge long-term partnerships. 19. Before I conclude, I wish all delegates and participants a great success for the exhibition and fruitful deliberations in the conference. I hope that this platform shall usher a new era in the strategic partnerships and collaboration in the Indian civil aviation sector to make India as a hub of world class aerospace technology and services.